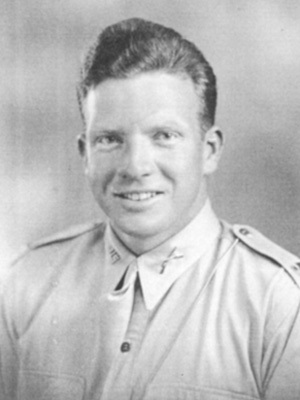 Major Jack A. Johnson died in the battle for Monte Cassino on January 25, 1944. Johnson, who had replaced the injured Major James Lovell as the 100th Infantry Battalion’s executive officer in early January, was accompanying the unit’s new commanding officer, Major George Dewey, on a reconnaissance mission when both men were wounded in a German minefield. Because they lay in a field exposed to enemy fire, battalion headquarters sent only two litter bearers and their single stretcher for the wounded officers. The soldiers had been ordered to “save Jack first,” but in the confusion of battle, they returned with Major Dewey, who was near death. It would be another five hours before the litter bearers returned for Johnson. By then, he had nearly bled to death and was barely breathing. He died with his friend, 100th Battalion Chaplain Israel Yost, at his side. Some believe that Johnson had waved off the litter bearers when they first arrived, instructing them to take Dewey first. After all, Dewey was the unit’s commanding officer. Besides, Johnson was younger and stronger and wasn’t as badly injured. No one knows for sure what happened that day as the two medics who took Dewey were later killed in action. But the selfless act sounded like something the major would have done, say 100th Battalion veterans. By January 1944, the 100th had been in the field for four months, suffering heavy casualties in numerous actions. But the death of Major Johnson was an especially hard blow for the men, because not only had they lost a popular executive officer, but a fellow local boy as well. More than sixty-five years later, several surviving veterans remember him with aloha. When asked which officers they especially wanted remembered, the names Farrant Turner, James Lovell, Mitsuyoshi Fukuda — and Jack Johnson — were mentioned. John “Jack” Alexander Johnson Jr. was born June 9, 1913, in Los Angeles. His father, John Alexander Johnson, was an agronomist for C. Brewer and Company, one of Hawaii’s largest sugar companies. Jack grew up among the Islands’ elite, attending prestigious Punahou School. 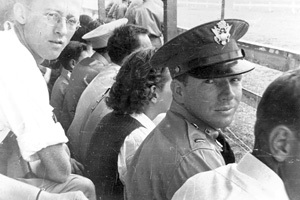 But instead of going to the Mainland for college like most of his classmates, Jack entered the University of Hawaii (UH), where he joined the school’s Reserve Officers’ Training Corps (ROTC) program. A good student, he would eventually be named student commandant. After graduating from the UH, Jack was hired by the McBryde Sugar Company of Kauai as a field supervisor. More commonly known on the plantation as “head luna,” the field supervisor was the entry level position in the plantation’s unofficial management training program. Many of Hawaii’s plantation managers and company presidents had started their careers as head lunas. It was there on Kauai that Jack met Elizabeth “Betsy” Sinclair Knudsen, the daughter of one of the island’s long-established kamaaina families. Betsy and her sister attended Lihue Grammar School for eight years and later Punahou School on Oahu. At home on Kauai, she spent time riding, swimming at the beaches of Poipu or going to their mountain retreat, Halemanu, at Kokee. It was while she was home for the summer that she met Jack for the first time. “He liked to do the things we liked to do,” Betsy recalls. “We were outdoor girls. We went hunting with my dad, we went to parties — Jack was a very good dancer . . . and took moonlight horseback rides.” There was mutual interest and, eventually, romance. But at age 18, Betsy left for junior college and drama school in New York, returning to Kauai in the summer.